"There was one occasion in the department when a boss touched me and I told him if he did it again, I'd knock the s— out of him. He did not repeat it, but he did try to get me to curtail from the position," Abercrombie-Winstanley told the Foreign Service Journal, a publication by the American Foreign Service Association. "Initially, I parried the advance from a senior member of Congress, but when he continued to call me, I reported to the NSC's executive secretary that it was happening, and told him that if I had to do violence to repel it, I would," Abercombie-Winstanley said. "I was letting him know beforehand, I said, because I did not expect to lose my job as a result," she added. "After a moment of shocked silence, he said 'Thanks for letting me know.' And the member stopped calling me." She later told VOA these occasions are an "extremely small part of my professional journey" and declined to either comment further on details or identify the congressman. In a letter electronically distributed to all American diplomats around the world earlier this year, Secretary of State Rex Tillerson said the department upholds a "zero-tolerance" policy regarding discriminatory and sexual harassment. "Effective harassment prevention efforts must start with and involve the highest level possible," Tillerson said in his policy statement. "I am frequently the only woman in meetings outside the office with the host country, and when I have control over the guest list, I insist that we include at least 30 percent women, if not more," U.S. 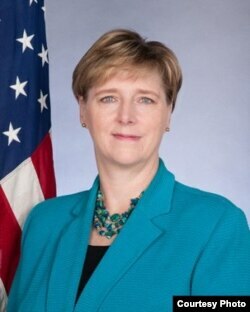 Ambassador to Nicaragua Laura Dogu said in the Foreign Service Journal article. FILE - U.S. 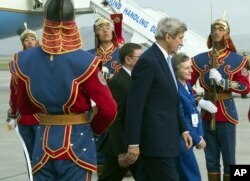 Ambassador to Mongolia Jennifer Zimdahl Galt and U.S. Secretary of State John Kerry past a traditional honor guard upon arrival at Chinggis Khaan International Airport in Ulaanbaatar, Mongolia, June 5, 2016. "So you can speak authoritatively and there is no question that you are on top of your brief. It's also important to dress professionally, which in my book means wearing a suit at all times," said Galt, who was appointed as principle deputy assistant secretary for educational and cultural affairs earlier this month. She also said, "Being sure to listen carefully to what others have to say so that you're not repeating, but rather amplifying and adding value with your remarks." In a speech to student programs and fellowship participants in August, Tillerson said he had directed relevant committees to develop "minority leadership" at the State Department. "Every time we have an opening for an ambassador position, at least one of the candidates must be a minority candidate. Now they may not be ready, but we will know where the talent pool is," Tillerson said. In Senate testimony, Goldstein thanked his spouse for supporting his career of developing and executing communications strategies that connect diverse audiences.